Judy Freiwirth, Psy.D., is the principal of Nonprofit Solutions Associate. She is a contributing author to a recently published book, Nonprofit Governance: Innovative Perspectives and Approaches. She serves on the board of the national Alliance for Nonprofit Management. This valuable and unique article, adapted from a larger report by the Governance Affinity Group of the Alliance for Nonprofit Management, reveals through surveying board chairs themselves some common oversights in succession planning for that critical role. Nonprofits should share this with their boards and schedule a time for a discussion! Member organizing and advocacy, resignations, and calls for board action, along with frequent press coverage, resulted in the passage of the eventual resolution to end psychologists’ complicity in government interrogations and torture programs. Last year, the Occupy movement successfully ushered in a long awaited public and political dialogue about structural economic inequality. That accomplishment—where others had tried and failed—may have emerged directly from how Occupy handled themselves as a movement, using a transparency and inclusiveness that many derided at first. The Occupy movement’s inclusive methods may not have been perfect but they worked and are undeniably instructive to the rest of us working to make a more just and equitable economy/world/community. Here, then, is a reflection from an expert on governance with a discussion of what might be learned. 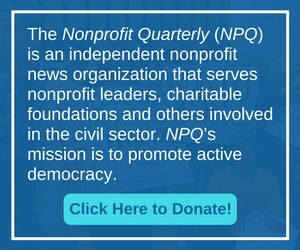 Subscribe now to NPQ’s print magazine to read “General Assembly,” a chapter from Occupying Wall Street: The Inside Story of an Action that Changed America, by Writers of the 99%. Examining the United Way’s evaluation framework emphasizing program outcomes.